Recently I met with BiFab workers and trade union representatives at their yard in Methil to discuss their future and concerns as we near the end of their current Beatrice contract. I also raised the issue directly with the First Minister during FMQs where I called for continued Government support to ensure we can protect jobs and the company can survive any gap in their order book. That is why I am hosting a meeting in the Scottish Parliament tomorrow to allow trade union members to meet and lobby MSPs from all parties as we work to secure the future of the yards. On December the 6th I joined colleagues in attending the Day of Action Against Blacklisting lobby outside the Scottish Parliament. The day was part of a long running campaign from Unite the Union into blacklisting within the construction industry. Cases of blacklisting within construction companies is unacceptable. These workers give their time and skill to their employers and should be rewarded for their duty, not punished. 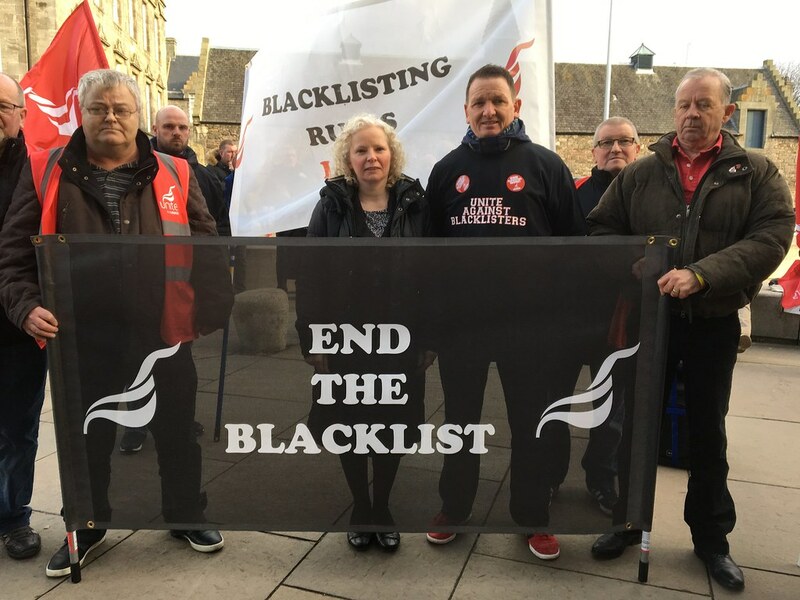 As part of the campaign, Unite is calling for a full public enquiry into blacklisting, for the process to be considered a criminal offence, and for companies found blacklisting to be barred from bidding for public sector contracts. Today I questioned the Energy Minister as he announced that the current moratorium on fracking will be extended indefinitely. As a long time campaigner against fracking in my region welcome this move, however it still stops short of an outright ban. I’ve been campaigning against fracking and UCG locally since 2012 and I will continue to support any efforts to introduce a full legislative ban. I can reveal that the number of jury trials in Kirkcaldy have almost doubled in the past 5 years and that is why I have reiterated my calls for a new, state of the art, Justice Centre in the town. Statistics released to me have revealed the strain been felt by the current court. In the past 5 years, the total number of trails called has increased from 1,196 to 2,060, amongst those the number of jury trails called have increased by almost 100%. At the same time, there has been a 55% increase in the number of trails adjourned, a quarter of which were adjourned due to a lack of court time in the past year. This is despite an increase in the number of days the court has sat. With the Queensferry Crossing opening this year I have called for a charity event to celebrate the new bridge and raise vital funds for local and national charities. The event would follow the success of the ‘M74 bike and hike’ which took place before the opening of the M74 extension in Glasgow in 2011. This event saw around 20,000 participants take part in 2 separate courses; a short 4km route or the longer 14km round trip. Participants could raise money for the charity of their choice but the event officially recognised 8 main organisations, including SAMH, Macmillan Cancer Support and the British Heart Foundation. This was a great way to open the M74 extension and simultaneously raise awareness and money for charity and it would be fantastic if such an event could be arranged for the opening of the Queensferry Crossing. I have no doubt that Fifers would love the opportunity to be amongst the first to cross the bridge and take part in what could be a full day of fun stretching from one side of the Forth to the other. With great views of the rail and road bridge along with the coast of Fife, the opportunity for people to cross the bridge before it is open to cars should be fully considered. This would be a great initiative to raise money for local charities such as MND Scotland but also for the many local charities across Mid Scotland and Fife that do great work day in day out. I hope that people across the region can get behind an event to mark the opening of the crossing event and that the Scottish Government will make such an event a reality. I have called for the Scottish Government to step up and take action on the illegal and anti-social use of quad bikes and motorised scooters after they confirmed to me that they were not taking any action to encourage the responsible selling and ownership of such vehicles. I am disappointed and deeply frustrated that despite a commitment from the previous Minister for Community Safety, the Scottish Government have now decided to hide behind the UK Government rather than take action. I have been campaigning against such anti-social behaviour for some time and I have organised roundtables, met with the Police, campaigners, and concerned members of the public, and raised the issue many times in Parliament. Today Scottish Labour announced a plan to freeze Scotrail prices. Passengers across Mid Scotland and Fife are fed up with overpriced, overcrowded and unreliable trains. Despite this, fares are due to rise in January. That is why Scottish Labour is calling for a fares freeze. After weeks of misery, people across the region deserve a better deal. With over 300 shopworkers assaulted every day I am pleased to support Usdaw’s campaign to call for an end to abuse in the workplace. As part of the Freedom From Fear Campaign, which seeks to prevent violence, threats and abuse directed at retail staff, Usdaw members came to Parliament to highlight the problems faced by staff during Respect for Shopworkers Week. Too often retail employees are confronted with violence, threats and abuse whilst serving the public. 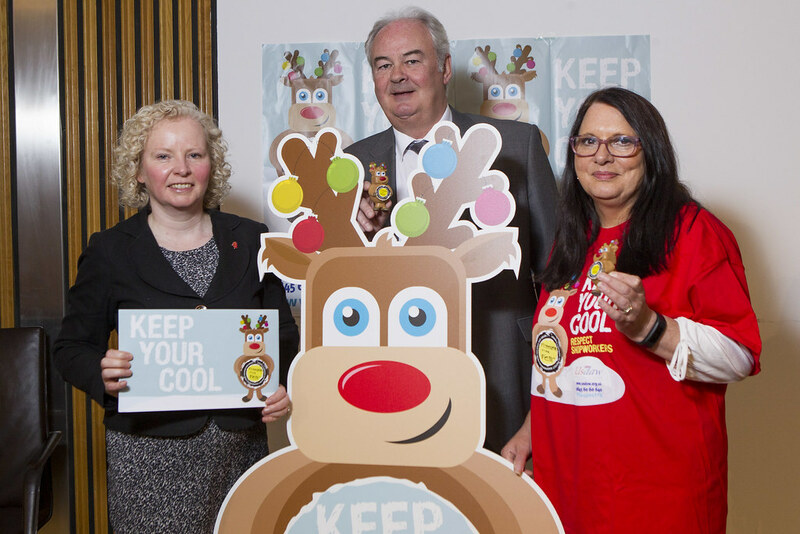 It is really important we stand together and ask people to keep their cool and respect shopworkers, especially as we approach the busy Christmas shopping period. No one should have to go to work expecting abuse. I will continue to campaign with Usdaw to provide shopworkers the support they need and deserve. We must give a clear message that abusing or assaulting workers who are serving the public is totally unacceptable. Recently I met with the Transport Minister and Transport Scotland where I once again called for the re-introduction of Levenmouth Rail Link. I’ve been campaigning for its re-introduction since I was first elected in 2007 and was pleased that my lobbying resulted in it being included in Scottish Labour’s manifesto ahead of last year’s election. However there is still much work to be done and recently I also took part in a local conference with Levenmouth Rail Campaign, Fife Council and opposition politicians, which you can read about on Fife Today. I look forward to working together as we continue to campaign for its re-introduction. After first raising concerns over Underground Coal Gasification in 2013, I’m delighted that today it was announced UCG has no place in Scotland. It was clear from the outset that this was an unnecessary and environmentally damaging process that had no place in the region. I was pleased when my successful call to have UCG include in a moratorium was accepted last year and that research has now left the Scottish Government with no option but to rule UCG out. Whilst Fife will no longer be a guinea-pig for UCG, this can only be the first step. The Scottish Government must now come out and ban fracking so once and for all we can have a Frack Free Fife.